Rafaella and Ashley share a friendship that began a few years ago and has reunited them at Temple Israel. When Rafaella and her family left the city for the suburbs they knew that Ashley and her family would love it as well. These two friends have children the same age, are Jewish by choice, and shared the desire to find a reform Jewish community for their families. 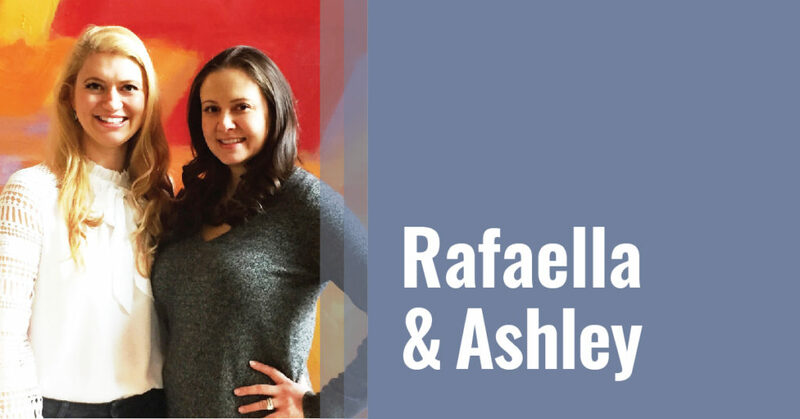 As a good friend would do, Rafaella shared her experience at Temple Israel Early Childhood Center with Ashley and as they say… the rest is history. Rafaella: We have Scarlet who is 4 and Saxon who is 18 months. Scarlet & Saxon also have an older sister Sofia who lives in Delaware with her mom. Ashley:We have Olivia who is 4 years old and Emma who is also 18 months. Will your little ones be going into the 2s program at Temple Israeltogether? Rafaella & Ashley: Yes! Can’t wait! You knew each other prior to coming together at Temple Israel? How long have you been friends and where did you meet? Ashley: We met in NYC when both of our oldest daughters were in the 2s together. Rafaella and I hit it off from the beginning and kept mentioning that our husbands should get to know one another. We all ended up meeting at the beginning of the school year and funny enough, we both got pregnant within weeks of meeting each other. What made you select Temple Israel? Rafaella:I wanted both kids to attend school at a synagogue. I looked into Temple Israel, scheduled an appointment with Nancy Isaacs and was sold right off the bat. Temple Israel feels so warm and inviting the minute you walk through the doors. Ashley: Rafaella obviously was the reason we knew and decided on the school. I also knew we wanted to continue with a Jewish pre-school. What makes the Temple Israelcommunity special to your family? Rafaella:I love that there are so many activities for the children, social events for the adults and the holidays at Temple Israel are the best! The majority of my friends in Westport are the moms I’ve met at Temple Israel. Ashley: I wanted a good pre-school for my children, and I feel that it is a bonus that Temple Israel feels so much like a community. I love knowing there is so much more than just school classes. The synagogue has endless opportunities for us to get involved and I know my children will continue to religious school with their friends. My friends, who have children in other pre-schools don’t have this involvement or longevity. What’s your favorite thing to do together as friends? Both:We love to just hang out at each other’s homes…eat, drink, and be merry! What one thing would people be surprised to know about you? Rafaella: I used to race cars and I can start a great fire probably better than most. Ashley:I am more shy than most people think. I dislike cocktail parties, particularly for work, where you walk in, have to find someone, and make small talk. I would prefer an intimate dinner any day. Close your eyes and imagine yourself anywhere in the world for a 24 hr adventure…where would it be and who would you take with you, if anyone at all? Rafaella:My husband & me in Monte Carlo watching the Formula 1 races! Ashley: I get to travel often enough and really never have downtime, so if I could be selfish, I would love 24 hours on a plane in first class, watching movies, reading a book, being served by a flight attendant, and being able to nap whenever I want!